Ok, I bought it. And after adding shipping and tax if I don’t use my complimentary return I’ll feel jipped. This so called “free” sizing returns actually means they build it in to everyone’s order if they use it or not. It also strikes me now…I have my halloween costume here! If I could find my Ned. Always on the lookout for my Ned. 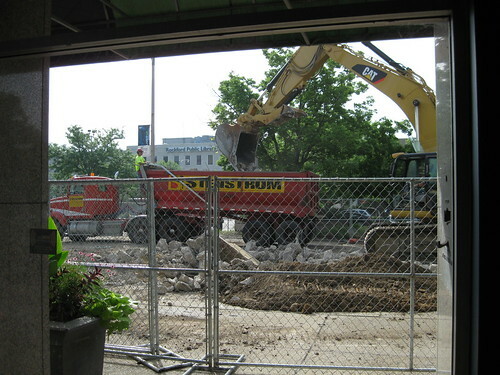 The pedestrian mall they put in on Main Street in the 1970s is coming down this summer. They are putting the road back in. Ironically, they put the mall in to revitalized the downtown and give shoppers a place to congregate. Now they are taking it out to…revitalize the downtown area and give the shoppers more vehicular mobility. Both ideas are stupid since there are not that many shoppers anyway. West State street is a two way and its business are no more or less shopped at than those on Main Street. Now the traffic will change and people will be able to get from point A to point C much faster. I doubt they will make a stop at point B (the downtown). Oh well. As long as they are speedy about it and my desk stops vibrating in a few days. They had a mechanized jack-hammer going. Oh dear. What I learned from all of this is that no matter how much our robot overlords will one day love us, they are not built for love. This thing above was ripping off chucks of cement with each tender touch. A hug or even a handshake would be fatal. Just look at that poor plating job! Chef Ramsay would be pissed. I usually make a small pan of this stuff, but making tiny loaves really adds to the portability, freezability, cutability. Why didn’t I think of this? I am still getting used to this cooking for one. I don’t think it is a thing you get used to though. Get the recipe here.